When we think of canals, our first thought it usually Venice. On second thought, however, we may consider the packs of tourists that descend on that stunning city and the increasingly frustrated locals who want these tourists to just go away. Fortunately, there are several cities throughout Europe that are less-visited than Venice and also crisscrossed with lovely waterways. 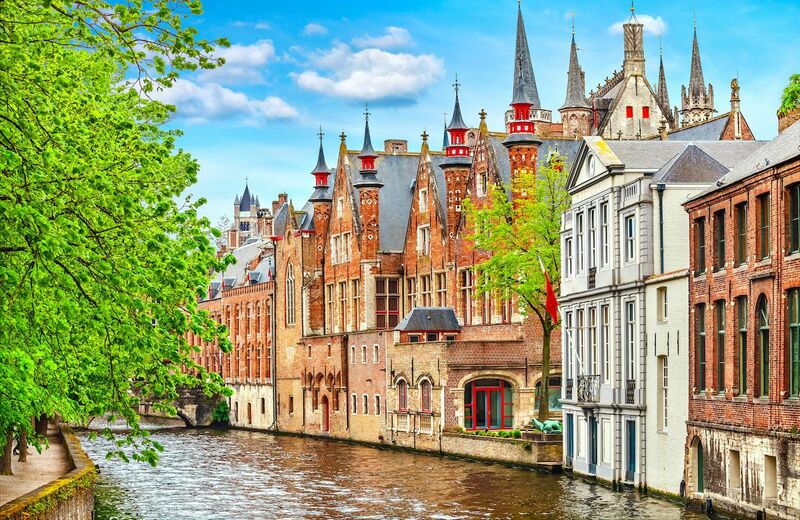 Quite a few European towns — that are not Venice or even Amsterdam — have historic architecture overlooking picturesque canals. 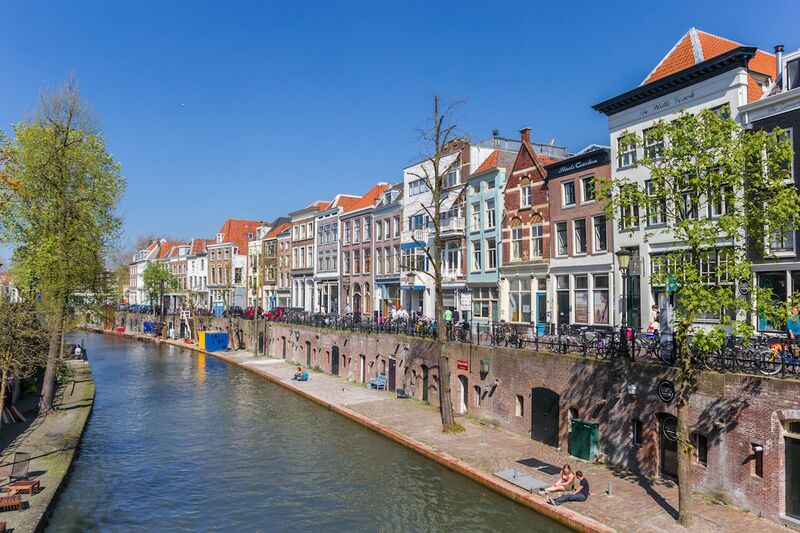 So, hop on a boat or a bike and wind your way along the water in these seven canal cities. Bruges is one of the most colorfully distinctive cities in Europe. Thanks to its network of winding canals, 15th-century buildings, and ornate church steeples, it was declared a World Heritage Site by UNESCO in 2000. Once a mandatory stop for merchant ships selling first fabric, and later Castilian and Basque wool, Bruges was the heart of a thriving medieval European economy. It’s still a hub for trade; since the 1980s, its neighboring Zeebrugge port has become the largest in the world for import and export of new vehicles. City tours offer boat expeditions, which are an excellent way to see otherwise inaccessible parts of the city, but if the idea makes you seasick, you can take a horse-drawn carriage tour. While you’re there, enjoy the hundreds of museums, Beguinage (once a place for devout laywomen to live independently without husbands), and numerous bars and restaurants. 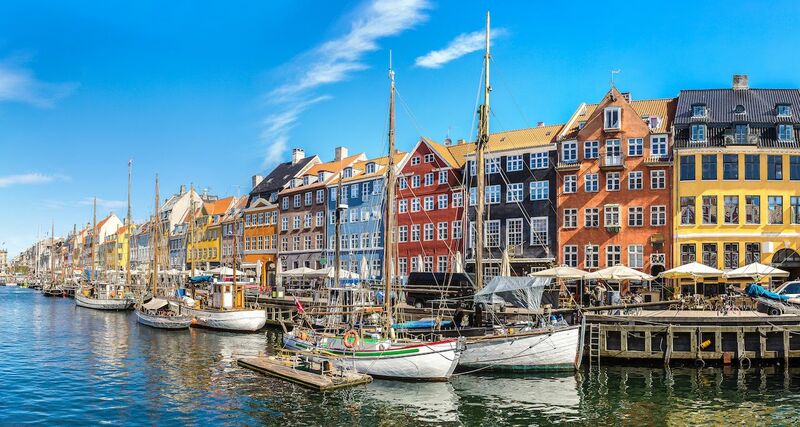 You’ll find everything from places with simpler fare of beer and carbonade flamande (Belgian beef stew) to the only restaurant in Bruges to hold 3 Michelin stars, Hertog Jan.
Copenhagen’s charming old port area, Nyhavn, which translates to “new port,” connects the oldest part of Copenhagen to the sea and was once a bustling hive of activity — all of it legal. Since it was many sailors’ first port of call into town, the area was a bit of a red-light district with many taverns and brothels available for men who had been at sea too long. Author Hans Christian Andersen, whose famed fairy tales include The Little Mermaid, lived along the canal for more than two decades and wrote The Princess and the Pea in his apartment at number 20 — which you will see on a boat tour leaving from the Nyhavn launch area. The tour also passes by Freetown Christiania, a progressive intentional community and independent state within the city of Copenhagen. If you wish to visit Christiania, you must go by land, though, since the dock is closed to non-residents. Nyhavn is also known for the bright colors of the rowhouses lining the canal edges, as well as the historic wooden boats docked along the sidewalks. Originally located on a swamp, Empuriabrava was transformed into an inviting tourist destination with over 15 miles of canals thanks to a concerted effort by the town’s community leaders in 1964. Several large marinas accommodate pleasure yachts and small boats alike, and water activities are the huge draw in this tiny town. You can visit several medieval castles and museums in town, or you can ignore culture in favor of the white-sand beaches with gentle waves. The nearby Aiguamolls de l’Empordà Natural Park features over 330 species of migratory birds and offers a variety of curated tours through the park, all which are designed to minimize human impact on the environment. There is an overabundance of seafood restaurants, but many are open seasonally. If you plan your trip outside of the summer months, phone ahead to make sure the restaurants and other services are still open. Annecy is called the “Pearl of the French Alps.” Because of its location, squeezed between Lake Annecy and the Semnoz mountains, Annecy can’t grow much — so it has preserved its old town as it was centuries ago, threaded with more canals than roads. It’s not packed with tourist attractions or booming nightlife. Its charm comes instead from peaceful waterways lined with pastel-colored houses, nonstop gelaterias, tiny cafes, and restaurants. It’s a perfect place to get lost for a few hours and see where you end up. That could be at the weekly fresh fish and vegetable markets scattered around the dozens of bridges in the old town, or it might be at Chateau d’Annecy. The castle looms over the town from the top of a hill and was a residence for the Counts of Geneva before a series of fires caused them to abandon it. The nearby lake and mountains also make Annecy a fantastic destination for winter-sports enthusiasts. In fact, Annecy applied to host the 2018 Winter Olympics but lost to Pyeongchang. You may have enjoyed the canals of Amsterdam, but Utrecht’s waterways are also lined with numerous shops, cafes, and restaurants. The unique wharves, which once accommodated medieval merchant ships, now provide patio and terrace space for people looking to enjoy a glass of wine. The center of town is a car-free pedestrian zone, so you can stroll the narrow and windy cobblestone streets at your leisure. The inner canal ring is less than four miles long, making it easy to check out many of the oldest and quaintest parts of town in one day — even with stops for ice cream. For the best view across this picturesque city, climb the Dom Tower. Just be prepared for 465 steps up the tallest church steeple in the Netherlands. Rent a bike and you will see Utrecht in the best possible way — unless you want a gondola ride along the canals instead. 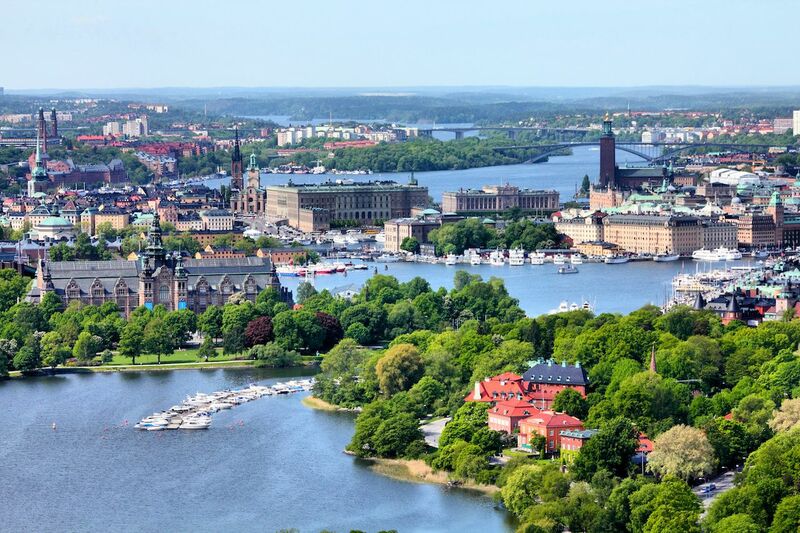 Sweden’s capital, an elegant city whose architecture dates as far back as the 13th century, spans 14 islands and holds over 50 bridges. Gamla Stan, the old town by Stockholm Palace (home of Sweden’s royal family) and many other government buildings, is built across a few small islands. Visit the Vasa Museum where you can see a massive 17th-century warship, then take a boat tour along the canals for a unique perspective on this city of islands. If you visit Stockholm in the winter, you can see ice sheets being carried through the city on miles of waterways, and sometimes you will also see disgruntled swans or ducks, wondering why they can’t swim anywhere. Also in the winter, you can do skridskosegl, or skate sailing, which is like windsurfing but with ice skates. During either season, you can finish up a day of touring with a restful fika (coffee and pastry) in a waterside cafe — although you’ll be having it indoors in winter — or venture in search of some of the best eating in Scandinavia for dinner. Technically part of Europe, Russia’s second largest city was founded on swampland. Peter the Great had the city drained into a series of canals modeled on Amsterdam’s iconic waterways, creating a city with 190 miles of rivers and canals. You can drift down the Moyka Canal and enjoy the stunning 18th-century mansions built along the banks, including several small palaces and the Pushkin Museum. The 324-foot-wide Blue Bridge is the widest bridge in the whole city, although you might not even realize it’s a bridge since it’s home to bustling Saint Isaac’s Square. 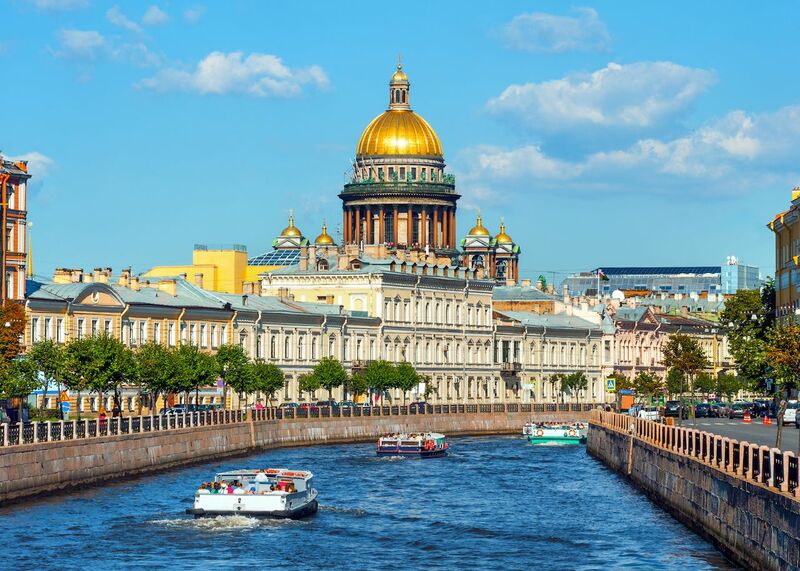 You can also go along the Winter Canal, which connects the Moyka with Bolshaya Neva, for some stunning views of the Rococo-style Winter Palace, the site of the famous February Revolution of 1917. Enjoy daytime boat trips along the numerous historical rivers and canals, or hit up a nighttime floating restaurant, which can feature live music and a wide range of local cuisine.